Happiness is a choice. It is a state of mind. In the same way you select your clothes each day, you need to learn how to select your thoughts. This is a power you can cultivate. Your thoughts create your world. When you wake up in the morning you have the choice to be happy or not. When something bad happens, you can decide to dwell on it, let it affect you and allow negativity to manifest. or you can choose to brush it off and let it go. How you think and how you feel is entirely up to you. If you want to be sad, no one in the world can make you happy. But if you make up your mind to be happy, no one and nothing on earth can take that happiness away from you. I am a huge believer in the power of positive thinking. I believe you are a product of your own thoughts. What you think about, you bring about. It is all in the mind. Where your mind goes, energy flows. Focus on negativity and you’ll only attract more negativity. Possess a positive mindset and you’ll attract more positive energy into your world. I am not saying it is possible to think, feel and be positive 100% of the time (as amazing as that would be), but it is certainly possible to try. Living a life of positivity is about trying to see the best in every situation. It is about moving past the things you cannot control and focusing your energy on the things you can. You may not be able to control events or the way others treat you, but you can control how you react. The only person you are hurting by holding on to negativity, is yourself. Think happy thoughts and manifest positivity. With a happy, healthy mind, you can create a happy, healthy life. 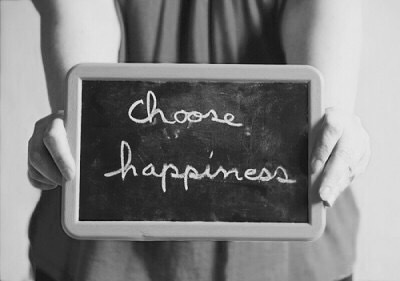 Happiness is a choice. Not a result. Nothing will make you happy, until you choose to be happy. Choosing to be happy isn’t always easy but you can train your mind to cultivate the art of positive thinking. Here are some ways you can take control of your own happiness. Practice Gratitude: Gratitude turns what we have into enough. It can be so easy to focus on all the things you don’t have but when you stop, take a moment and think about all the things you are thankful for, it becomes apparent how blessed you truly are. When you express gratitude for all the things you do have the more things you will have to feel grateful for. Be More Mindful. Live in the Moment: ‘If you are always rushing to the next moment, what happens to the one you are in?”. The secret to happiness could be as simple as becoming more mindful. Sometimes you need to slow down, remain within the present and not stress about the next moment. This can reduce feelings of anxiety. Enjoy the Little Things: It’s usually the little things, the small acts of kindness, the simple things that bring us the most joy. It isn’t always about the big picture, but the little moments that make us smile that truly matter. Smile: It’s amazing what a smile can do to lift your mood or even make someone else day. Smiling is contagious after all. Do More of What Makes You Happy: Life is too short to waste precious time doing things you do not like or spending time with people who bring you down. Do more of the things that you enjoy doing and bring you happiness. This is absolutely brilliant, exactly the message I hope to put across. Wow love this. I agree with every part of your post!